In ancient times wooden shoes or clogs have been widely used. They were ideal footwear at a time that roads were not yet covered with stones or other hard surfaces. They protected against dirt and mud and could easily be put on and off when going in and out. Dutch and Swedish clogs are still known all over the world but only a few know about Japanese clogs. To the Dutch it seems only a matter of course that once there have been clogs with skating blades underneath. But skates as shown here have never been made industrially. They are quite scarce and seem to have been made for fun only. The clog skates in this picture have no marks and look as if they have never been used for skating. They were made in the second quarter of the 20th century. Also in Japan clogs have been common footwear. Unlike Dutch clogs Japanese clogs do not have the appearance of a shoe or boot. They consist of a wooden platform with two stilts placed athwart underneath. The stilts can vary in height from 2-4 inches and must prevent a kimono from being dragged through street dirt. They were called geta (pronounce ge as in get and ta as in tart). 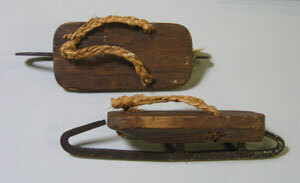 Japanese geta (in Japanese no plural exists) have hanao, V-shaped harnesses as with toe slippers. Traditional hanao are red for women and black for men. As geta do not have protective caps for the toes protection against cold must come from tabi, a kind of mitten-socks. In winter time thick waterproof tabi were worn. 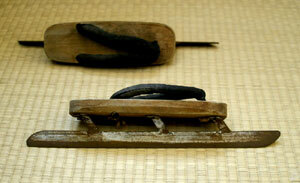 The pictures show two kinds of geta skates. It seems odd that geta skates do not have heel straps or so, but it is most likely that Japanese are that accustomed to wearing geta that they have very strong toe muscles. 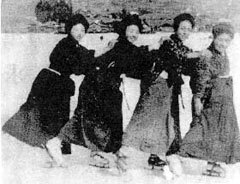 Japanese texts seem to hint that geta skates were used on hard snow rather than on ice. Skating almost must have been a kind of walking then. The picture below was made around 1925 and proofs that they have been used indeed. The photo's underneath show a striking resemblance between Japanese geta and Dutch trips. 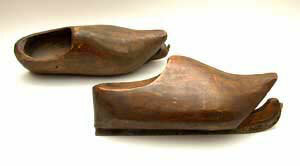 Trips were a kind of open clogs that are known to have been used from the 14th till the 17th century. They consisted of a wooden sole with two short stilts underneath and two triangular pieces of leather at the top that could be connected by a lip and notches to fit the individual foot size. The photo's show the remains of 15th century trips with nails in the stilts as to provide for more grip on slippery surfaces like ice. It might be possible that this design was introduced in Japan by the Dutch during their stay in Nagasaki/Decima (1648-1823). At excavations in April 2006 near Mozahaisk (Moscow) shoe soles were found in a 12th/13th century earth layer that have metal heart shaped platforms underneath. As with the trips these platforms sit in the middle of the soles. 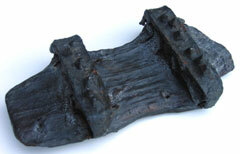 But, the soles were made of leather instead of wood and hence going on them must have been very uncomfortable. The Institute of Archaeology of the Academy of Sciences of the Russian Federation, that did the searching, wonders if the hearts have had a function that can be related to ice skating as they seem to have stimulated gliding rather than preventing it. They therefore would like to receive any comment onlookers may have.